Since bursting onto the scene in 1999 with the now classic album ‘Wide Angle,’ Hybrid has gained recognition as one of the most cutting edge and technically skilled acts in electronic dance music. After four extremely well received albums and over 20 singles, plus countless remixes and a raft of movie and game soundtrack work, it is time to reflect on some of the bands numerous highpoints. This exclusive new collection celebrates and relives these moments and includes cuts from their breakthrough album, the rare cover of Depeche Mode’s ‘Enjoy The Silence’ and much more. The band itself is divided by specific roles. Founding member Mike Truman handles studio production and instrumentation, whilst sound designer Chris Healings helps define the Hybrid aural experience with their unique sound palette. Chris also acts as the Hybrid Soundsystems’ global DJ. Newest member, Charlotte James, is an accompanying songwriter and multi-instrumentalist and supplies most of the female vocals for the group. Charlotte’s impact was marked when she joined for the band’s fourth album ‘Disappear Here.’ It was a poignant collection of real songs, a new direction in songwriting for the dance band, a step towards the full, rounded sound they have today. Hybrid’s music not only features expansive song arrangements and electronics, but also the liberal use of live orchestration, especially strings. They have recorded with orchestras all over the world from the 80+ member Russian Symphony Orchestra to the Prague Philharmonic. Their skill at uniquely merging these sounds has opened up an entire new world for Hybrid in the area of music production for television and feature films. As frequent collaborators with major film composer Harry Gregson-Williams, Hybrid has music production credits in many major blockbuster films including Total Recall, The Taking of Pelham 123, Wolverine, X Men Origins, The Chronicles Of Narnia - Prince Caspian, Deja Vu, Domino and Man on Fire. They have also composed the entire score for films including Catacombs and computer game scores for Ghost Recon. Although known primarily for their studio wizardry, the band has also blurred the lines between production and the live show. Their concerts have been numerous and worldwide, showcasing the then unique full ‘live band’ format fused with electronics and strings. 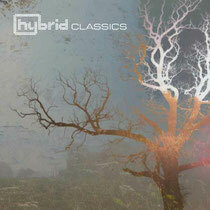 This compilation brings all the favorite Hybrid elements together. It’s out 30th July on Distinctive Records. three more weeks to go before this compilation is out. can't wait for it.